Frantic Stamper is proud to announce that we now have a YouTube channel of our very own! And to launch it we have a slideshow to share our January Release! Please take a look and tell us what you think. We hope to bring you more product announcement slideshows, how-to videos, and more! To visit our channel, search for Frantic Stamper in YouTube, or click this handy link. Here we are at the first 25th of the year! I know Christmas seems like yesterday, but we know that we all should be starting on making those special hand-made cards to send to friends and family! Here is a bit of inspiration for you from Karen. There's always "that one die" with every company.....you know "that one" I'm talking about.....that very special one that catches your eye immediately, and you can't stop thinking about it. Yes, now you're getting the idea. Well, for me....."that one special die" from Frantic Stamper was IMMEDIATELY the Frantic Stamper Original Precision Die called Large Blue Spruce. From the moment I saw this amazing die, I knew in my mind what I wanted to do with it. Right away, I was envisioning these sweet trees cut from vellum. I was envisioning the vellum making the trees appear as though they are snow-covered. I contemplated glittering them to also capture the feeling of snow; but instead, I layered the vellum trees, and then added some white sequins. I even used a small piece of double-sided foam tape to raise up one of the trees. Don't they look lovely? I think next time, I'll sprinkle them with some glitter. How pretty! My card uses some sweet Crate Paper patterned papers and adorable chipboard pieces from their Bundled Up Collection, and the sentiment I chose is a dainty little Melissa Frances Rub-On. 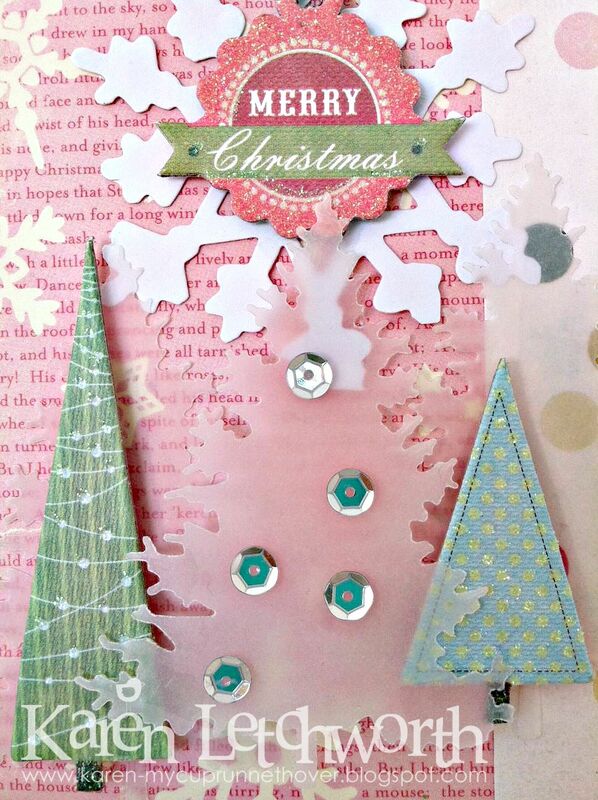 I tried to keep it simple so that these lovely vellum die-cut trees would be the star of my card. This last photo is a close-up of the second card. 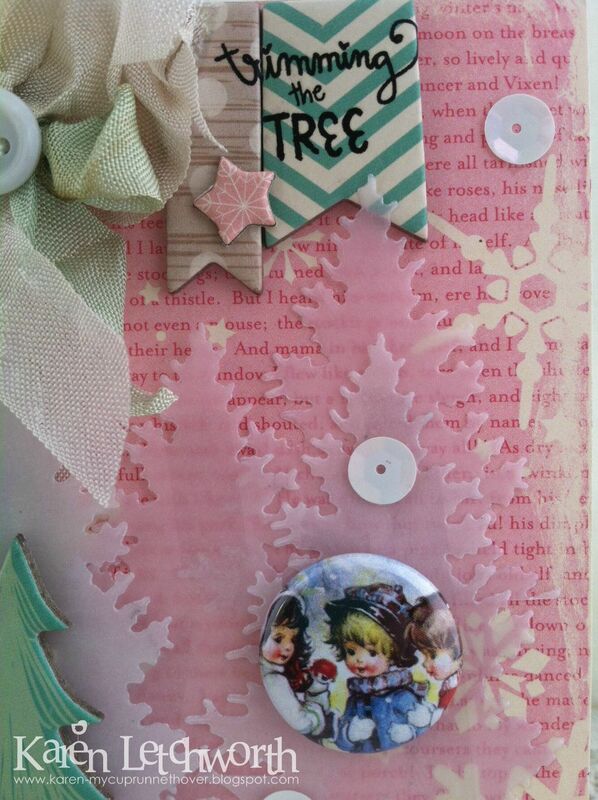 I just wanted you to see how the card looks with different numbers of layers of the vellum trees. Now, I've got myself thinking of using this die-cut to create gorgeous trees in green paper, in wool felt, in rustic paper, and so many other great textures and colors. What an amazingly GORGEOUS die-cut. Thanks so much for stopping by to take a look at the two cards I've created using this fabulous die-cut. I really encourage you to check out this sweet die for yourself. You really would love it; along with several other lovely tree dies and other amazing shapes Frantic Stamper sells. 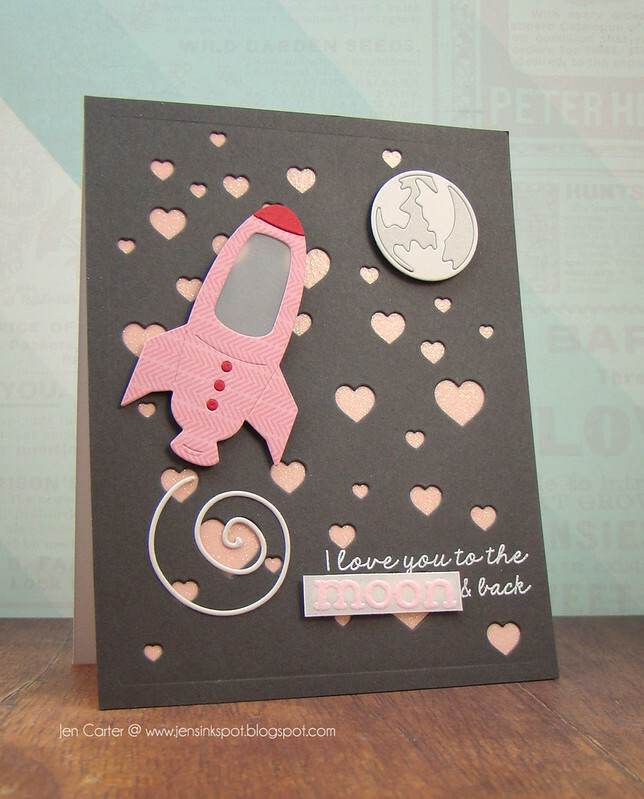 Use your imagination to use Frantic Stamper dies to help you create something wonderful today! Hi friends. I'm thrilled to be guest designing with Fran and the team this month. A big thanks to Kathy and Fran for having me. I started out by stamping the strip from MFT's Spotlight Sentiment stamp set at a diagonal. I then die cut the Delicious Cupcake dies. I cut the cake part from white card stock and then did some blending with two colors of distress inks. It's hard to tell in the photo but I also added some clear Wink of Stella to the cupcake. I love the wrapper part of the die as it also cuts several lines to give it a better look. This would be an easy card to mass produce and give as a gift. 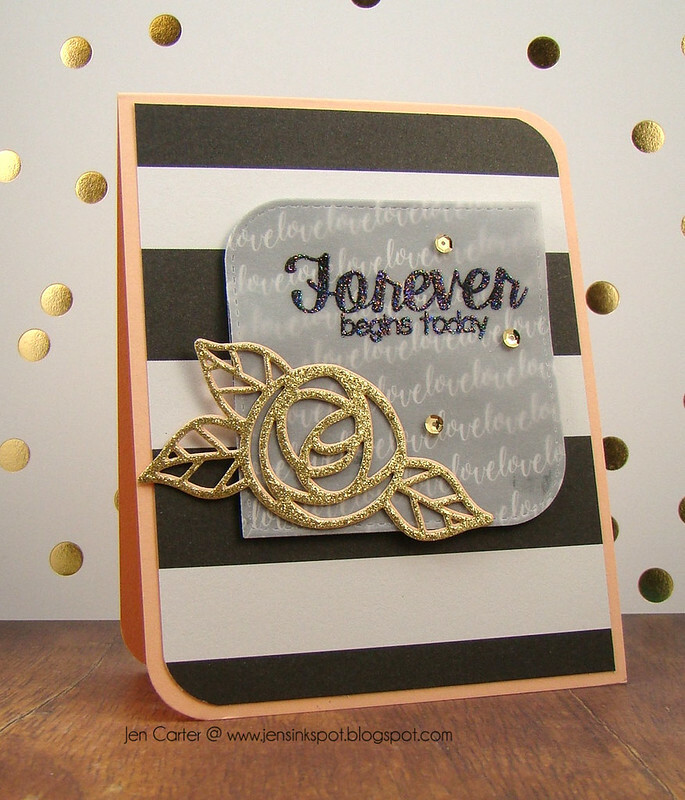 This is my first post as a Guest Designer for Frantic Stampers and I'm pretty excited to be here. 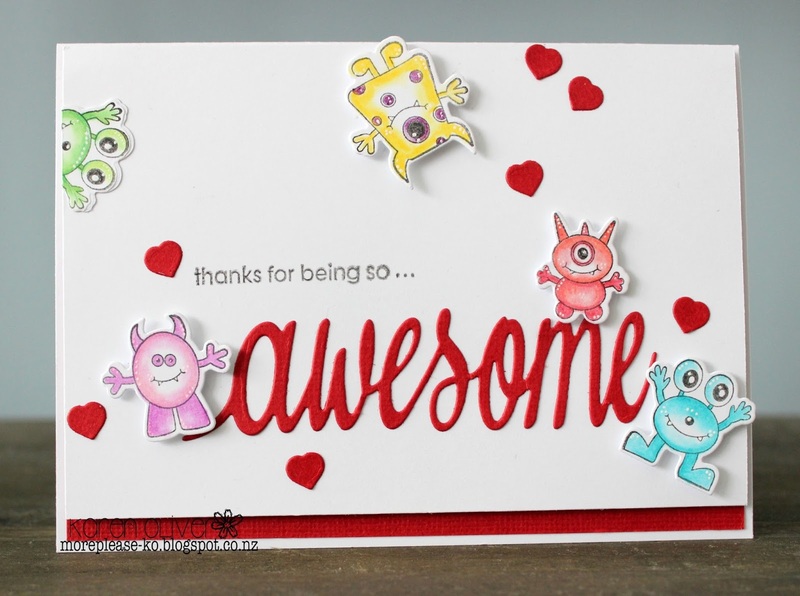 Frantic Stampers are pretty "awesome" and for this card I used the Monster Mash stamp and co-ordinating die set along with the separate word die, awesome. The little heart is also part of the Monster Mash die set. The cute little monsters are coloured with Derwent Coloursoft Pencils and I have used a white gel pen to add some highlights. They are popped up on foam except for the little fellow peeking around the corner. I have discovered a product called Stick It (available at Frantic Stampers) which is ideal for word dies and those that are a little more intricate. It doesn't add bulk but adds adhesive. To finish the card I added a strip of red card stock to the bottom and some red hearts. Its a fun little card that could be used for any occasion. 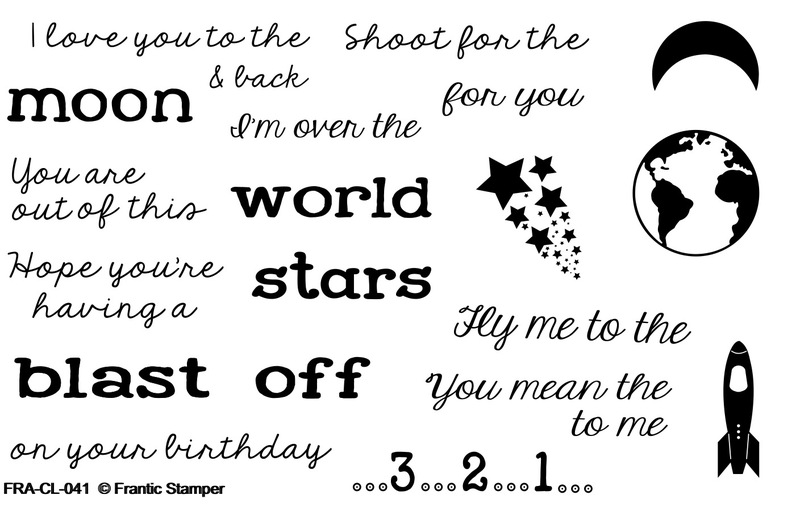 I am excited to share with you a new product assortment that is now available from Frantic Stamper. I think you'll find this set of products very versatile. I wanted to start by sharing a video that I created showcasing the products and then I'll share two cards, one masculine & one feminine. I hope that video gives you a nice showcase of these new products! Today, I wanted to show how you can create both feminine and masculine cards with these new products. Let's start first with a more traditional masculine card. I started this card with the blue background. I sponged blue distress inks around the top of the cardstock to create the night sky. I used VersaMark ink to stamp the stars & milky way swirl from the new The Final Frontier clear polymer stamp set on the background. After that I started building the rest of the scene. I started by applying a couple cloud layers cut with the new Stitched Cloud Edgers dies (set of 3). I didn't adhere the tops of the clouds so that they could be slightly "puffy" on the card for dimension. 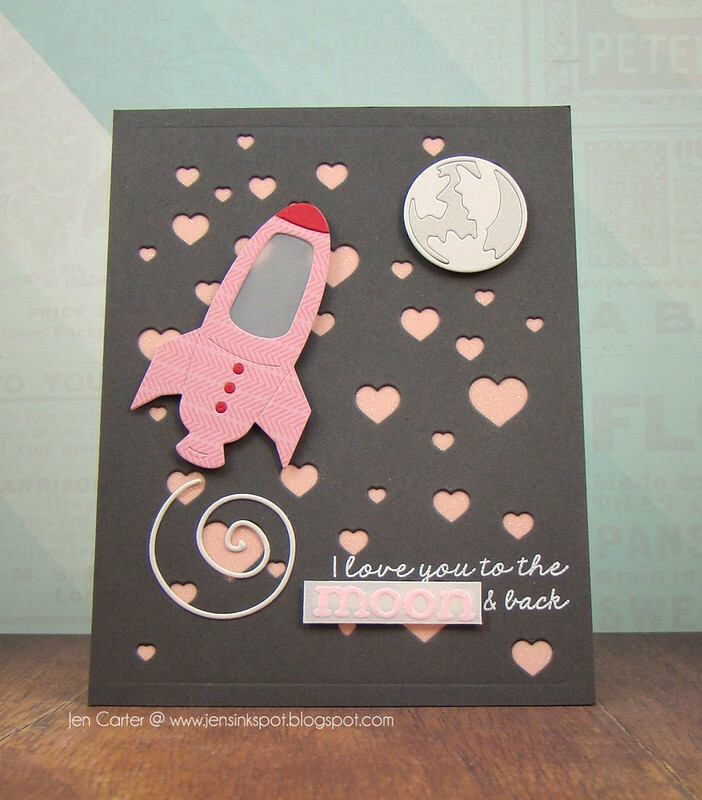 I stamped the mix & match sentiment from the new Sentiments from Space stamp set on the clouds. 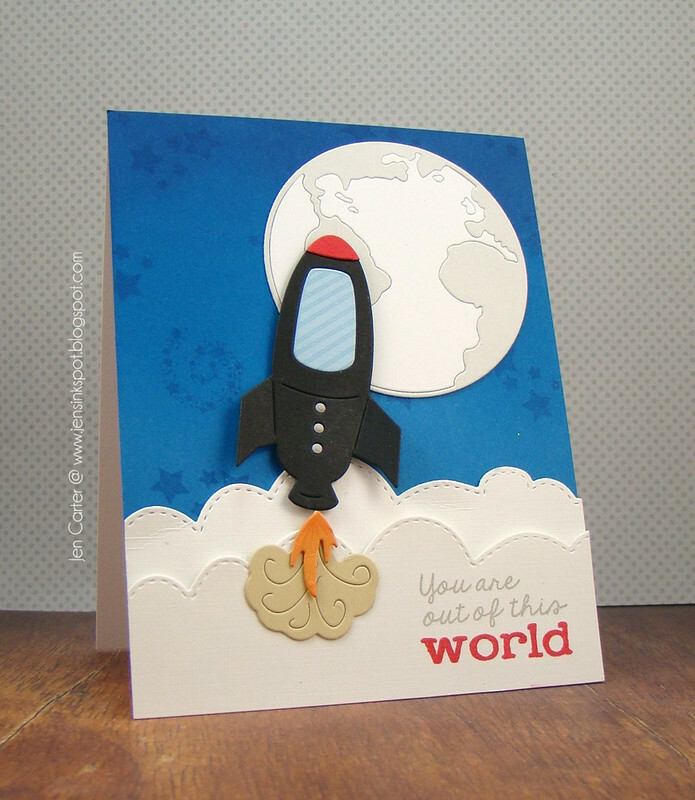 I die cut the rocket, the smoke cloud & the fire with the crazy fun and new Rocket Launch die set (set of 4). I cut the top of the cone off of the rocket with a few snips (easy to do because there is a line cut into the die there) and added a red nose cone for contrast. I also mixed & matched the window & the dots on the front. I stamped the window with one of the 6 window options in the new The Final Frontier clear polymer stamp set. The great big earth/planet is die cut from the previously released Planet Earth die that I think is super cool! Now for a feminine, Valentiney card! 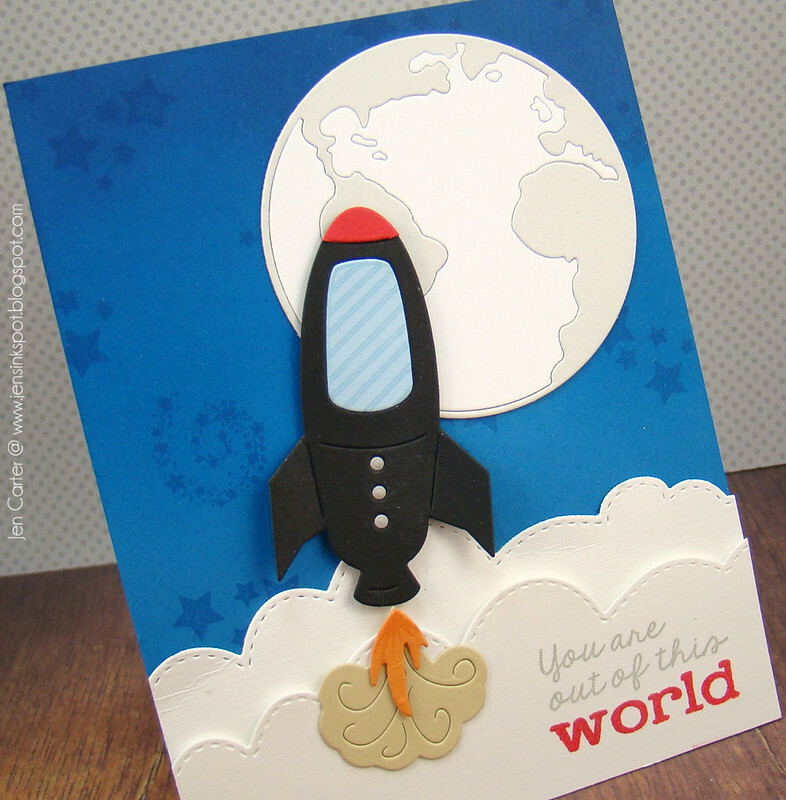 I cut this rocket from the Rocket Launch die set from patterned paper and for the window I placed vellum behind the cut out. I popped the rocket up with dimensionals. I also cut the tip off of the nose cone and used red cardstock for the tip and for the dots on front. For the background I used a previously released die called Heartfall. It made a great background for a love themed/Valentine-like card! I used pink glitter paper behind the cut out hearts. I used the swirl die cut from the new Outer Space Die Set (set of 7 dies) to make a rocket trail and also die cut the planet included in that same die set. The sentiment I used is one of my most FAVORITE because it is one I say to my kids all the time! It is from the Sentiments from Space stamp set. I embossed the sentiment directly on the gray cardstock and then embossed the "moon" on a piece of vellum that I attached with dimensionals. I hope you enjoyed this post. I know it was long! I look forward to sharing more projects I made using these new space themed products (including the Flying Saucer die that I haven't shared yet!). Before I go, I want to share a close up of the new stamp sets so that you can see all of the options. We are thrilled to tell you that Kia Gibson has agreed to stay on with us a full-time team member. We really love all she has brought to the team as a guest, and we are excited to have her join us in a full-time capacity, filling out our team for the year. We are also super-excited to tell you that we have two guests joining us for the next three months. Please welcome Alanna Moses and Karen Oliver to our team. We really look forward to working with them! And we are sure you will enjoy all the projects they will be sharing with us! Hi – I’m Alanna from Colorado and I am super excited to be guest designing for The Frantic Stamper for the next few months. I am a mother of three fabulous kiddos and a wife. I work full-time as a CPA in a local firm doing audit work. When I have a free moment, I love to hang out with my family and spend some time in my craft room getting inky. I have been scrapbooking and making cards for about the last 13 years or so. Although now, I mostly just make cards as that allows me to start and finish a project in a short amount of time. I love to send cards to friends and family unexpectedly to brighten their day. I’d love it if you stopped my blog, Embellish Craft Love at www.damoses.blogspot.com. 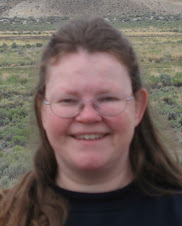 My name is Karen Oliver and I live on the outskirts of Auckland in the North Island of New Zealand. I am married to Dave and have 15 year old twins Nick and Abbey. I work at a local primary school teaching students (aged 5 to 11) who have English as a second language. embroidery to cake decorating and everything that comes in between. In more recent years I started playing with paper and haven’t stopped since. I love cute and layers and am drawn to the shabby hues. When I am not making cards I am either doing things with my children or have my nose in a book. Its an absolute pleasure and privilege to be a Guest Designer with Frantic Stampers and I look forward to sharing my creations over the next few months. For today's card I went with a wedding theme. 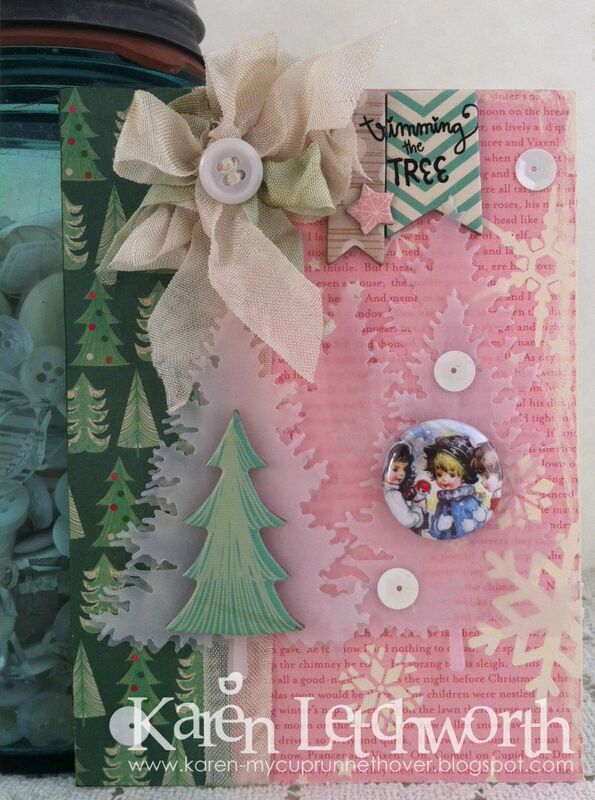 Frantic Stamper released their December die collection and there are some great dies in this collection! And they released two new clear stamp sets. From this release, I was especially excited about the new Scribble Roses set! This set has two sizes of roses in it. 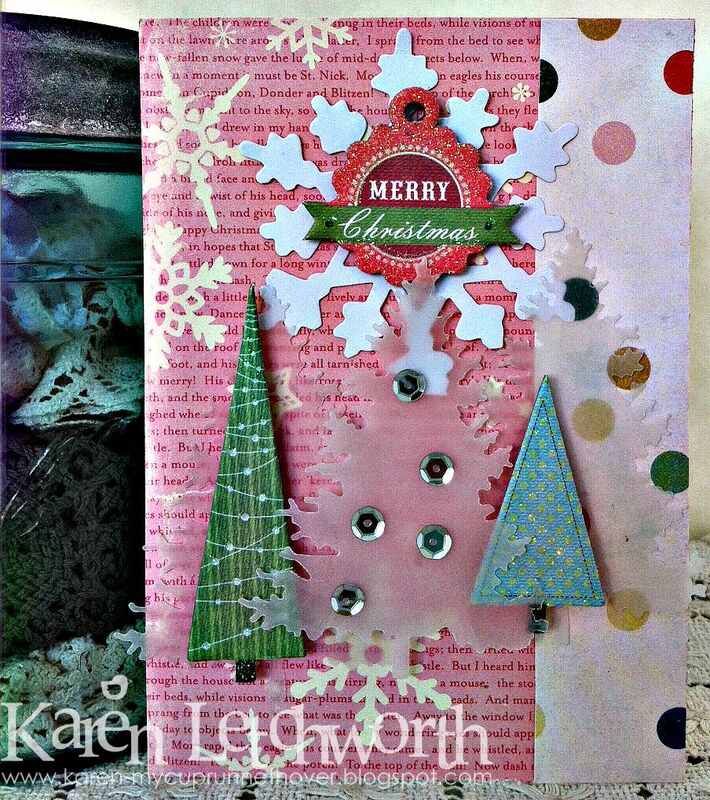 For this card I used the largest die and cut it twice, one with gold glitter paper and once with a soft orange. I layered the gold on top but kept it slightly off center so that you could see the soft orange shadow. I matted that on top of a shaped die cut with vellum (black & white patterned paper is layered underneath) that was cut with the newStitched Petal Squares dies. Now let's talk about that sentiment. This comes from a new, trendy stamp set by Frantic Stamper called Wedding Wishes. 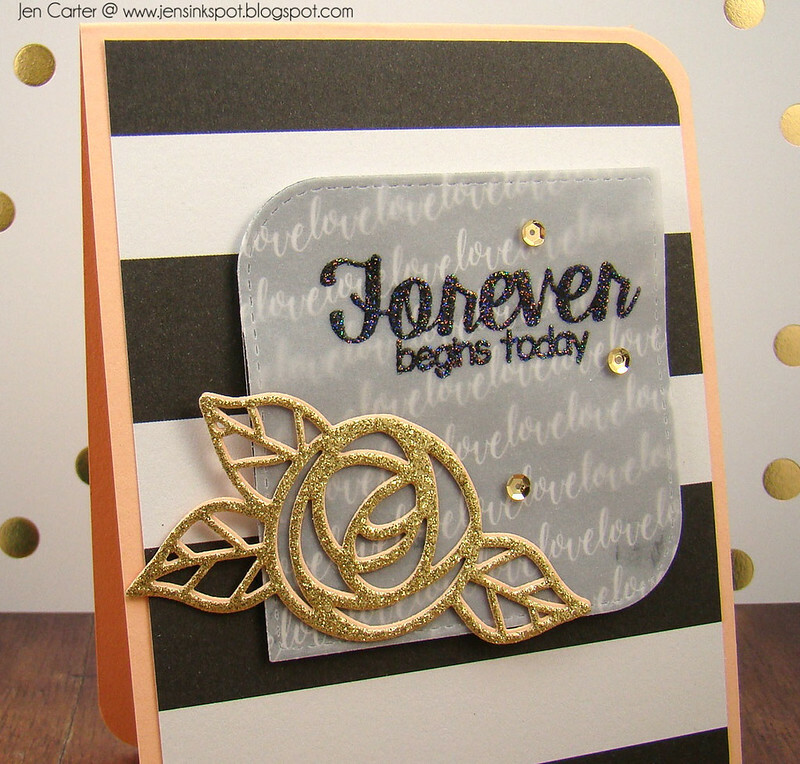 There are so many cute sentiments in this set and it pairs so well with this new rose die! I stamped the sentiment in black and embossed it with sparkling clear embossing powder. I love the shimmer it gives it! Thank you for visiting! Be sure to check out the entire December die collection! Happy 2016, everyone! We hope your new year will be filled with happiness, health, and paper crafting! To start the new year we want to ask you to join us in thanking Rachelle Green for her wonderful work and to wish her well as she goes on to other endeavors. We all enjoyed her time with our design team, and are so very grateful for all of her beautiful work. We also would like to announce that Rozy Smith will be with us in a new and somewhat more limited role. Rozy has agreed to be our first-ever Design Team Emerita. Rozy will be sharing occasional projects on our Facebook page. We thank Rozy for all of her work, and for being such an integral member of our team over the past few years. Her outgoing personality and her friendliness have made working with her a joy. 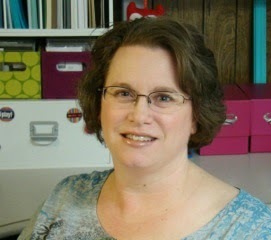 Karen Letchworth will be joining our team full-time for the next year. Karen first joined us as a guest, but has consented to stay on. We hope you will help us to make Karen feel welcomed in her new capacity. See the sidebar of this post to follow our blog and join our Facebook page so you can see all of the wonderful work produced by our design team, and for other Frantic Stamper announcements, including new guest designers, new releases, and occasional contests and giveaways.